Yaqona (yang-GO-na) is a tranquilizing, nonalcoholic drink that numbs the tongue and lips. Better known as kava, it's made from the waka (dried root) of the pepper plant (Macropiper methysticum). This ceremonial preparation is the most honored feature of the formal life of Fijians, Tongans, and Samoans. It is performed with the utmost gravity according to a sacramental ritual to mark births, marriages, deaths, official visits, the installation of a new chief, etc. New mats are first spread on the floor, on which a hand-carved tanoa (a wooden bowl nearly a meter wide) is placed. A long fiber cord decorated with cowrie shells leads from the bowl to the guests of honor. At the end of the cord is a white cowrie, which symbolizes a link to ancestral spirits. As many as 70 men take their places before the bowl. The officiates are adorned with tapa, fiber, and croton leaves, their torsos smeared with glistening coconut oil, their faces usually blackened. The guests present a bundle of waka to the hosts, along with a short speech explaining their visit, a custom known as a sevusevu. The sevusevu is received by the hosts and acknowledged with a short speech of acceptance. The waka are then scraped clean and pounded in a tabili (mortar). Formerly they were chewed. Nowadays the pulp is put in a cloth sack and mixed with water in the tanoa. In the ceremony the yaqona is kneaded and strained through vau (hibiscus) fibers. The mixer displays the strength of the grog (kava) to the mata ni vanua (master of ceremonies) by pouring out a cupful into the tanoa. If the mata ni vanua considers the mix too strong, he calls for wai (water), then says "Lose" (mix), and the mixer proceeds. Again he shows the consistency to the mata ni vanua by pouring out a cupful. If it appears right, the mata ni vanua says "Loba" (squeeze). The mixer squeezes the remaining juice out of the pulp, puts it aside, and announces, "Sa lose oti saka na yaqona, vaka turaga" (the kava is ready, my chief). He runs both hands around the rim of the tanoa and claps three times. <\f\f>The mata ni vanua then says "Talo" (serve). The cupbearer squats in front of the tanoa with a bilo (half coconut shell), which the mixer fills. The cupbearer then presents the first cup to the guest of honor, who claps once and drains it, and everyone claps three times. The second cup goes to the guests' mata ni vanua, who claps once and drinks. The man sitting next to the mixer says "Aa," and everyone answers "Maca" (empty). The third cup is for the first local chief, who claps once before drinking, and everyone claps three times after. Then the mata ni vanua of the first local chief claps once and drinks, and everyone says "Maca." The same occurs for the second local chief and his mata ni vanua. After these six men have finished their cups, the mixer announces, "Sa maca saka tu na yaqona, vaka turaga" (the bowl is empty, my chief), and the mata ni vanua says "Cobo" (clap). The mixer then runs both hands around the rim of the tanoa and claps three times. This terminates the full ceremony, but then a second bowl is prepared and everyone drinks. During the drinking of the first bowl, complete silence must be maintained. 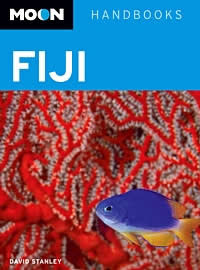 Excerpted from pages 341 and 342 of the ninth edition of Moon Fiji published by Avalon Travel of Berkeley, California. Used with permission: Reproduction Prohibited. Copyright David Stanley 2011.